A children’s hospice charity covering Dorset and Wiltshire has been given a fundraising boost by a national car parks operator after their jim-jams fundraiser. 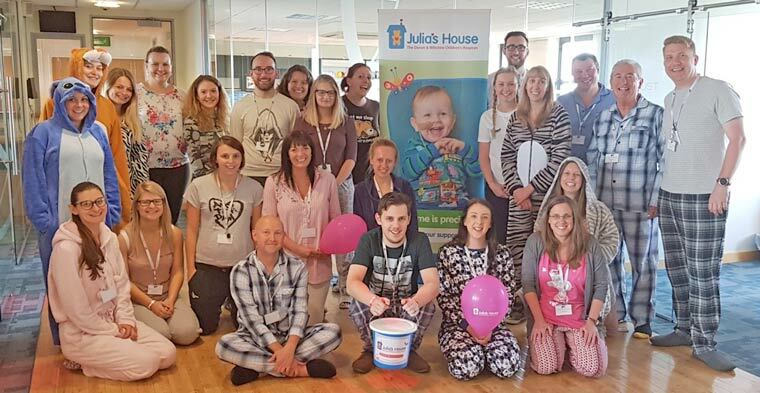 Staff at Britannia Parking’s new headquarters in Bournemouth wore pyjamas and onesies in aid of Julia’s House this month. More than £450 was raised as part of Pyjama Day, one of the highlight events of Children’s Hospice Week nationally. There are 49,000 children across the UK with life-limiting conditions, with Julia’s House in Corfe Mullen, near Wimborne in Dorset, providing practical and emotional support for local families. Mark Watts, Group Commercial Development Manager at Britannia Parking, said, “Whilst we stopped short of a sleepover, we got into the fundraising spirit with fetching pyjamas, onesies and slippers. Britannia Parking, which has more than 545 parking sites and 300 staff nationwide, recently moved into County Gates House, Westbourne, having outgrown its premises in Bournemouth town centre.